A few weeks back this arrived for me, the new Clarisonic : Mia 2. I heard such great things about it but until now this great skincare tool was only available abroad.... untill now ! Yes, that's right. Clarisonic is coming to Belgium @ Ici Paris XL . What's so great about this facial sonic cleanser you ask? well, I've been using it for over 2 weeks now every morning + evening and I already feel such a difference. I've never ever had a product or tool which gave me such effective results in such little time period! This means .. it really does work ! woohoo !! 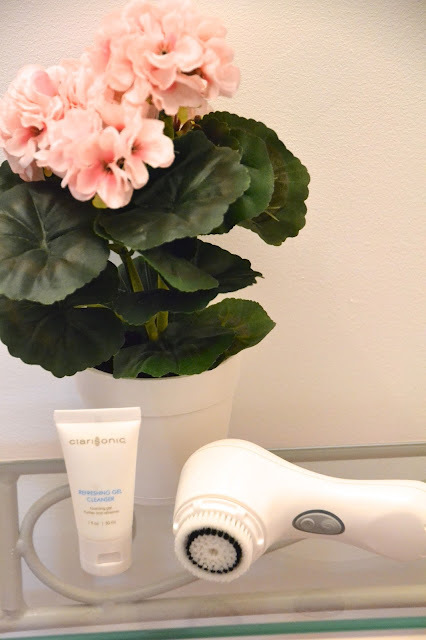 rinse your face with warm water and hold your Clarisonic under some warm water (read warm not hot ;-) ) .Then apply a normal amount of cleansing gel on your skin (forehead, cheeks, nose and chin). You can use whatever cleansing gel you like. I prefer one without little scrub particles because the brush already feels quite 'peeling'. Start with your forehead. Use the Mia in circular motions. Once the 20 seconds are up you will hear a beep. Then go to your nose and chin area and do the same. Once those 20 seconds are up the beep goes again and it's time to move to 1 cheek. After 10 seconds the beep sounds and it's time to go to the other cheek. When those 10 seconds are up the Mia stops by herself ! That's just how easy and (dare I say) idiot proof it is ! Keep an eye on Ici Paris XL because once they start selling the Clarisonic Mia 2, I think you won't be alone standing in line to buy this lovely skincare tool ! available soon @ Ici Paris XL !